A San Jose State water polo player has been accused of sexually assaulting two fellow students at an off-campus party over the Labor Day weekend, police and university officials said Tuesday. 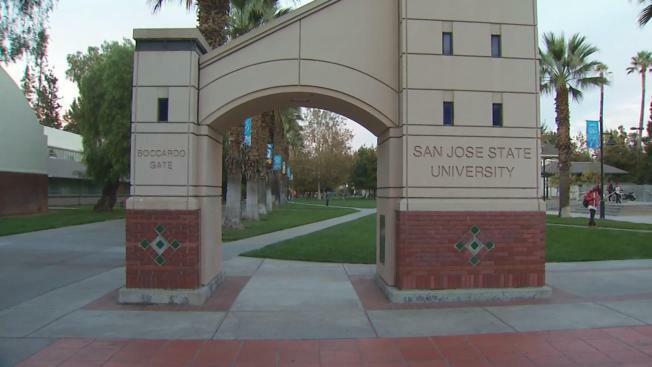 Two women students say they were sexually assaulted by a male freshman, and the school and San Jose police have been investigating the accusations since they were first reported more than a month ago. The case has made it to the Santa Clara County District Attorney's Office for review, and the student-athlete has been banned from the campus and from team events during the investigation. Many students are concerned that they are just learning about the alleged assaults now. "It is kind of troubling for me knowing that happened, and we didn’t know about it," said Yuthika Agarwal, a sophomore. The university is not releasing the name of the accused athlete because he has not been arrested or charged. A university spokesperson said he is an international student, and it appears he has left the country. Still, many on campus are upset they weren’t told sooner. "I feel like the school has failed in failing to notify us and it's concerning," senior Joe Kavalaris said. "We should have been notified from day one." Agarwal added, "If you hear about it, you kind of stay more on guard knowing these kind of things are happening around here. I would have felt safer." University officials said a campus alert was not sent out because the suspect was immediately interviewed and investigated by San Jose police detectives, university police and officials after the allegations were reported. Out of the 19 student-athletes listed on the San Jose roster, five of them list hometowns outside of the United States.